This Expressway is a major route for the vehicular traffic from Abu Dhabi City area through the Saadiyat Island towards northern emirates passing through Yas Island. 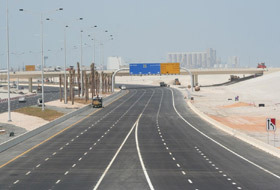 Subsequent to the award of the Saadiyat Bridge, Saif Bin Darwish has undertaken the work of the Expressway from the Saadiyat Bridge towards Yas Island which is about6000m of dual carriageway of five lanes in each direction. 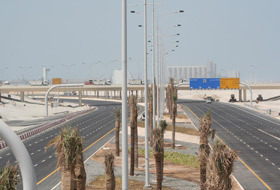 The Expressway is built to pass over the grade separated interchanges and over a small tunnel placed to serve local roads in Saadiyat Island. The Expressway is composed of all the utility installations along and across it such as potable water, storm water, sewer network and Irrigation works. Further, the associated beach roads about 20km of dual carriageway form part of the Contract. The works have been undertaken in December 2007 and the Expressway was handed-over to the Owner, Leighton – TDIC on 31 August 2009. The connection of the Yas Island through this expressway to Saadiyat Island makes it possible for a through traffic from Abu Dhabi to the Northern Emirates especially Dubai, Sharjah etc. in a different direction from the traditional route through the Maqta Bridge used to these destinations.